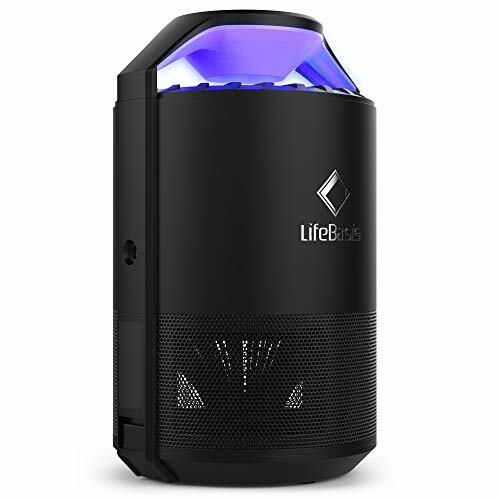 Life basis nontoxic energy-efficient, mosquito-repellent lamp protects your family from insect bites and other trouble, to create a good environment for your comfortable sleep and rest. 2. Lightly press the top power switch and select the mode: "Silent Mode" -when people are close to the mosquito killer; otherwise, you can choose the "Strong Mode ". At this time, the mosquito zapper 's suction is enhanced and the effect is better. 3. Press the top power switch again, and the mosquito killer will stop working. 2. Don't use it close to air-condition or fan, as the strong wind may reduce the effect. You may get the best effect when use it in confined space without any people there. 3. Please don't stare at the light of the mosquito killer for long time or get close to it, as the light may hurt your eyes or your skin. 4. When using it, the mosquito killer should be put in the area where the children can't touch, and don't put finger, metal or any other things into it. Otherwise it may cause the danger. 5. When the wire or blower is damaged, to avoid the danger please let the professionals to fix it or change it. 【High Efficient】 Eddy current structure and large suction entrance, mosquitoes are more likely to be attracted, double prevention escapes net, making the mosquitoes difficult to escape. 【Advanced Design】Using multi-band smart chip switching technology, automatic switching between 365 nm and 395 nm bands, more effectively capture temptation mosquitoes. 【Two Modes】Strong mode and silent mode, strong mode before sleep, silent mode for sleeping, help you enjoy your night. 【Convenient】USB for charging. Put a button can remove mosquitoes. Flexible operation, convenient for cleaning, adding more convenience to your life. 【Safe for Use】 Use physical way to kill mosquitoes, no harm to the body, passed certifications, low voltage guarantee no security risks, safer for you.